I was thrilled to acquire a beautiful limited edition giclee of "Windswept" by Linzi Lynn. I was extremely attracted to the vibrant "Bright" colors and flowing feel of "Windswept". I found this piece to be very versatile and it went beautifully in my living room, It added a "Bright pop of Color and Movement" to my room. I tried a new idea , of standing up my smaller sized painting on an end table, and was delighted with the look. It turned out to be a "Bright Idea" of displaying my "Bright Painting"! In addition, it was a pleasure to do business with the artist. She was very accommodating , helpful and friendly. Great customer service and communication. It was a serendipitous moment when I found Linzi's shop. We simply adore her "Dad" painting. It comes to life and gives such positive energy to our room. It was an absolute pleasure working with her. She was gracious and very helpful. We purchased windswept and love it. Her work is very colorful and alive. We will be purchasing another one in the near future. I went on the Internet a while back looking for pictures to hang in my newly remodeled master bedroom. I was so attracted to pictures with a lot of color. It was love at first sight when I saw Windswept by Linzi Lynn. I don't normally make decisions quickly but in this case I knew I had to have it. It was a little scary because I was only seeing it online. However, when I received it it looked exactly like the picture on the Internet - if anything, better. I love, love, love it and never get tired of looking at it. I found Linzi's paintings on Pinterest and fell in love with the vibrant colors. I contacted Linzi and purchased a 4x4 foot print of "Windswept" on canvas. It arrived rolled up in a sturdy container in perfect condition to me in Alberta, Canada. I had it mounted on a wood frame. It hangs in my home based Hair Studio and looks amazing! Linzi was excellent to work with and very accommodating. I highly recommend her and her work! This will be my one and only giraffe painting - nothing could ever compare. 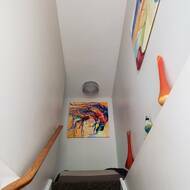 I even moved a Peter Max in order to hang "Giraffe Eating" where it now resides in a prominent place in our family room. It is so delightful and cheerful! We had a cocktail party last Thursday evening and I received at least seven or more wonderful compliments such as: so beautiful, so colorful, so whimsical, so happy, etc. on “Giraffe Eating”! I still love it as much as when I ordered it - and enjoy it every day. 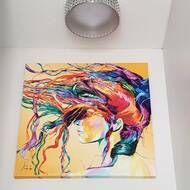 This picture "Windswept" did exactly what I wanted it to do for our guest room, it gave the whole room the pop of color and attitude it needed. I could look at this picture all day. I love it. Used this painting of "Windswept" in our beach condo remodel. Great statement piece in the master bedroom. The colors are rich and vivid. "Windswept": Love this - I should’ve bought the bigger size. "Windswept": Gorgeous colorful piece to use in any place that needs a touch of color and light. It is so colorful and beautiful! It fits the space perfectly. Love it!